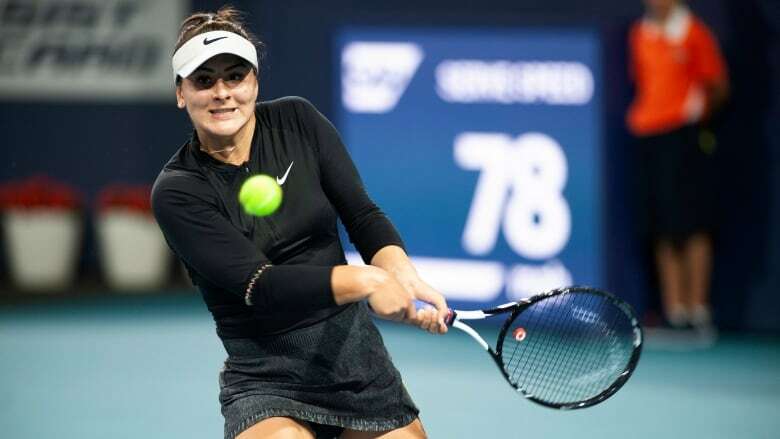 Rising Canadian tennis star Bianca Andreescu's 10th win in a row was another lengthy encounter. She downed No. 8 seed Angelique Kerber of Germany 6-4, 4-6, 6-1 in a third-round match at the Miami Open that finished late Sunday night. Her next match against No. 21 seed Anett Kontaveit is currently delayed by weather. Bianca Andreescu clearly doesn't mind working overtime. The rising Canadian tennis star's 10th win in a row was another lengthy encounter. She downed No. 8 seed Angelique Kerber of Germany 6-4, 4-6, 6-1 in a third-round match at the Miami Open that finished at 1:30 a.m. ET on Sunday morning. It was Andreescu's second win over Kerber in less than a week after the 18-year-old from Mississauga, Ont., beat Kerber in a thrilling final of the BNP Paribas Open last Sunday in Indian Wells, Calif. It wasn't clear what had upset Kerber. However, the three-time Grand Slam champion tried a more sporting approach in a post on Twitter later Sunday morning. Men's professional tennis player Nick Kyrgios appeared to question the sincerity of Kerber's tweet, replying with a tweet of his own. Andreescu, an 18-year-old from Mississauga, Ont., took a medical timeout after seven games to receive treatment on her right arm. The trainer returned on two other occasions to work on the arm and shoulder area. The Canadian did not immediately reply to Kerber's post. The match, which started at Hard Rock Stadium after 11:20 p.m., on Saturday, came hours after Andreescu was featured on the introduction of Hockey Night in Canada in a segment taped earlier this week in Miami. Four of Andreescu's last five matches have gone to three sets. "It wasn't easy today," Andreescu said in an on-court interview after her latest win. "Kerber played a really great match. But I think I took the momentum from the final into this match." Andreescu had 40 winners, 21 more than Kerber. With both players having played so much tennis recently, it was not surprising to see both players dealing with physical issues Saturday night. While Andreescu had right shoulder issues, Kerber had her left thigh taped for the match. As the late-night match went on, Kerber clearly was struggling with her movement. But she showed great resilience, fighting back from a 4-1 deficit in the second set to force the decider. Andreescu, playing her third match in three days, is now 31-3 on the 2019 season. She is ranked 24th in the world after starting the year 152nd. Andreescu broke Kerber in the final game of the first set and then did it again in the second game of the second set. But Kerber wouldn't bow out easily, clawing back from a big hole to win the second set. After a washroom break for both players, Andreescu responded by winning the first game of the third set on serve. She broke Kerber to take a 3-1 lead and held on from there. Once again, Andreescu showcased a wide variety of shots, though it was her powerful forehand that did the most damage. Andreescu will face No. 21 seed Anett Kontaveit of Estonia in the third round. On the men's side, Canada's Denis Shapovalov defeated Britain's Daniel Evans 4-6, 6-1, 6-3 on Saturday in second-round play. The No. 20 seed from Richmond Hill, Ont., had a 37-19 edge in winners. He needed just under two hours to complete the victory. Shapovalov will play qualifier Andrey Rublev in the third round after the Russian upset No. 9 seed Marin Cilic of Croatia 6-4, 6-4. Later Saturday, Shapovalov teamed up with India's Rohan Bopanna to beat American Austin Krajicek and New Zealand's Artem Sitak 7-5, 2-6, 10-6 in a first-round doubles match. Shapovalov and Bopanna face No. 7 seeds Marcel Granollers of Spain and Nikola Mektic of Croatia on Sunday. The fifth-seeded women's doubles team of Ottawa's Gabriela Dabrowski and China's Yifan Xu beat Slovenia's Dalila Jakupovic and Russia's Irina Khromacheva 6-2, 6-3 on Saturday. They'll meet Alicja Rosolska of Poland and Zhaoxuan Yang of China on Sunday. Canada's Milos Raonic and Felix Auger-Aliassime had Saturday off. Raonic, the No. 12 seed from Thornhill, Ont., will next play 19th-seeded Kyle Edmund of Britain in the third round on Sunday. Auger-Aliassime, a qualifier from Montreal, will play Poland's Hubert Hurkacz in another third-round match on Sunday. Hurkacz knocked Shapovalov out of the BNP Paribas Open in the fourth round last week.